The photo was uploaded to ‘Hannah Montana’ actor Moses Arias’ 490tx blog and Instagram account, along with some other pics of Jaden Smith and friends Kendall and Kylie Jenner. The pals appear to be just chilling on the bed, but the 20-year-old Moses had his shirt off. And while this seems like a harmless photo, people (most especially parents) have been ranting about it because Willow is still a minor. The fierce momma explains that there is “nothing sexual” about the photo and that people are just acting like “covert pedophiles.” So, that pretty much says that they are cool about Willow hanging around with shirtless older men in bed. Do you see anything wrong with the controversial pic, or is this whole thing being blown out of proportion? Jada was wearing sandals that were as fierce as her. 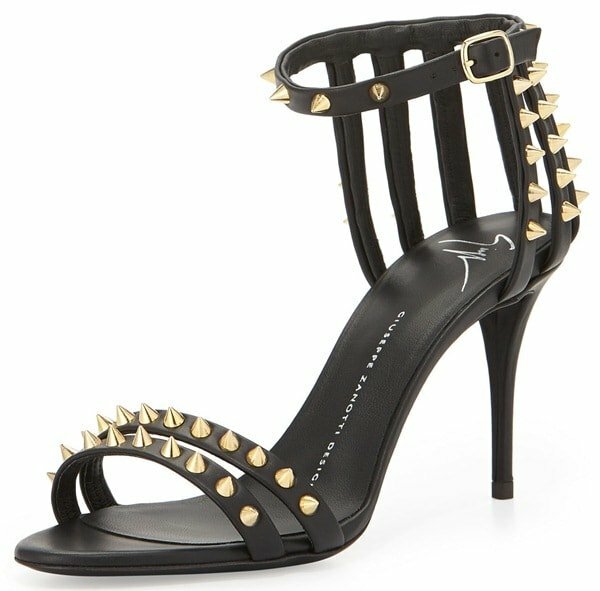 The Giuseppe Zanotti heels showcased spikes all over the straps. We couldn’t find this particular style online, but here’s a nice alternative with a similar design.